Born the seventh of 14 children in Green Cove Springs, Florida, Augusta Savage exhibited a talent and interest in the arts at an early age. After a marriage that left her widowed at the age of 16, Savage moved to Jacksonville, Florida to earn a living by sculpting portrait busts of prominent African Americans. In 1921, she moved to New York City and enrolled in the Cooper Union. She received many fellowships and awards, allowing her to travel and study abroad. In 1932, Savage began a notable teaching career with the founding of the Savage School of Arts and Crafts in New York. As an important figure in the Harlem Renaissance of the 1920s and 1930s, Savage worked with other important leaders, writers, musicians, and artists to celebrate the contributions of African American culture to American society. She overcame poverty, racism, and sexual discrimination to become one of 20th-century America's most prolific and influential sculptors. Because of her often-difficult financial situation, Augusta Savage's plaster originals were frequently destroyed before she could afford to have them cast in bronze. 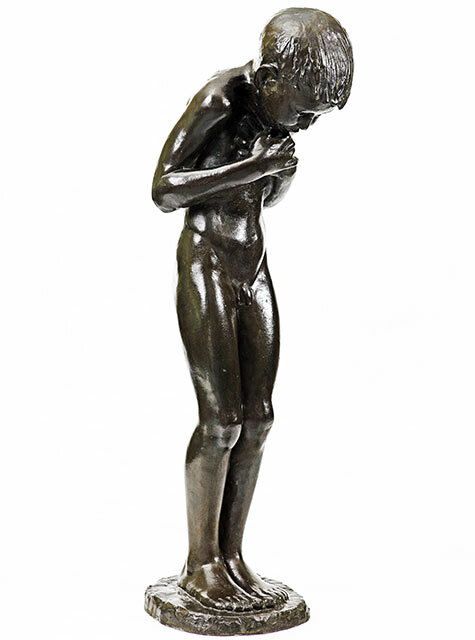 Originally placed at one end of a reflecting pond in Mr. and Mrs. Cummer's Italian Garden, The Diving Boy is typical of Savage's interest in combining realistic details with psychologically penetrating expressiveness.